appearance of the distal esophagus, on a contrast esophagram, in achalasia; also used to describe the proximal pyloric canal on upper GI series in congenital pyloric stenosis. the appearance of abnormal structures on radiographic images of the GI tract: the distal esophagus in achalasia and the proximal pyloric canal in pyloric stenosis. Appearance of the distal esophagus, on a contrast esophagram, in achalasia; also used to describe the proximal pyloric canal on upper gastrointestinal series in congenital pyloric stenosis. the hard keratinization (or rhamphotheca) which provides the horny covering of the beak bones, plus the beak bones, of birds. The dorsal ridge of the upper beak is the culmen, the similar keel of the lower beak is the gonys. The cutting edges of the beak are the tomia. Called also bill. traumatic separation of the upper and lower beak at the base requires hand feeding for survival of the bird. Some attempts at devising an artificial beak have been made, but attachment is a major problem. occurs with trauma and requires immobilization, often with innovative procedures (see acrylic glue), without restricting food intake by the bird during recovery. Severe trauma may result in avulsion of upper or lower beak. a condition of chickens and turkeys caused by excessively fine mashed feeds. can result from malocclusion, liver disease, lack of wear, aging, nutritional deficiency, and most commonly infestation by the mite, Cnemidocoptes pilae. the radiographic feature of contrast material extending through an elongated, concentrically narrowed pylorus indicative of hypertrophy of the sphincter. 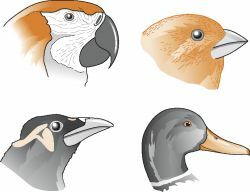 in most modern poultry houses the chances of cannibalism developing are so high that beak trimming is almost a necessity, especially if the birds are to be reared in full light. Light-restricted accommodation greatly reduces the prevalence of this vice. A temporary trim is done at a few days of age but a permanent trim is necessary later. Special instruments, utilizing a hot, cutting blade cautery, are used and the operation must be done by an expert or badly deformed beaks result and the birds are unable to feed properly. Alternatives to trimming include the fitting of spectacles or pick guards but these are expensive, time-consuming to put on and not feasible for birds in cages.